Looking for some practical furniture that’ll make the best use of space? In today’s post we recommend 17 amazing pieces of furniture that are specially designed for life in a small home. They are functional, attractive, and great value too. Life in a tiny house or small home is all about compromises. But compromise doesn’t have to be ugly. We all love our homes to look great, but in a small space, this often gets overruled by functionality. 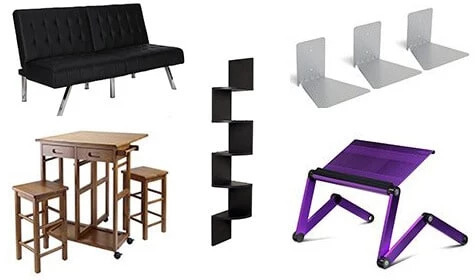 With this in mind, we’ve put together a list of some of our favorite space saving furniture ideas, that still manages to look pretty good too. These furnishings all excel in their design and make the best possible use of space. We cover everything including desks, tables, shelves, cabinets, organizers, and even sofas and beds. Each one has been designed with the need to make great use of space. We’re sure you’ll find some awesome tiny house furniture for your home with our guide. We’ve split our suggestions into three categories. We start with desk and table furniture, before we recommend some storage ideas, and finally beds and sofas. Every home needs a workspace for times when sending those emails just can’t be avoided any longer. A desk or office space is usually reserved for larger homes, but with a bit of innovative design, it doesn’t have to be. 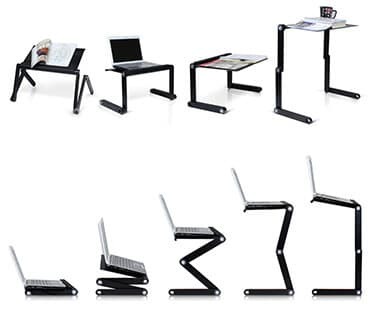 These amazing desks and tables can be folded or stored away in seconds, leaving the floor space clear for multiple uses. They’ve been specially made with small spaces in mind, but they don’t sacrifice on style or elegance. This walnut desk/organizer is a great piece of design, and perfect tiny home furniture. 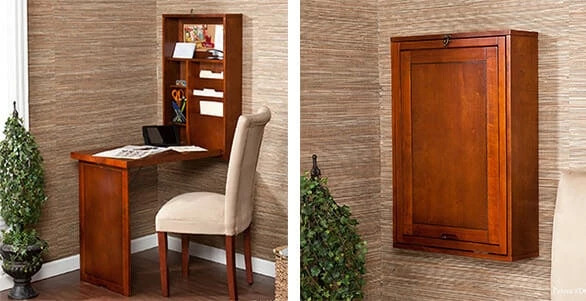 When not being used as a desk, it folds away neatly against the wall as a cabinet. This means it takes up no precious floor space when not in use. In fact, it doesn’t even take up much wall space either. The cabinet has two adjustable shelves, two stationary shelves, three bill organizers, and even a cork-board. This is the ultimate in space-saving design, and it looks great too. The convertible desk measures 22″ (width) x 36″ (depth) x 58″ (height) and folds away to 22 (width) x 6″ (depth) x 58″ (height) when closed as a cabinet on the wall. It is made of birch veneer and MDF, with a walnut finish. If you really need a coffee table for your small home, then they don’t get much more convenient than this one (you might want to check out our post on the 20 best coffee tables too). 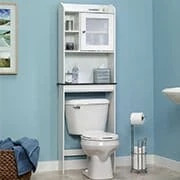 It combines style and amazing functionality so that you can make the best use of space in your home. The coffee table is made of a combination of wood, veneer, and MDF with an espresso finish. Measuring 47″ (w) x 23.25 (d) x 17″ (h), it has two deep drawers and a sliding table lid to provide lots of storage space. It’s a great piece of design that is perfect for life in a small home. This is tiny home furniture that is functional as well as being attractive. The Winsome Space Saver is another great little piece of design. It makes having a table possible in even the smallest of living spaces. It comes with two stools that are easily stowed away under the fold-up table when not in use. The table even has wheels that allow it to be easily stored out of the way. The tiny house table is made from solid and composite wood and finished in teak. It has two slide-out drawers and a paper towel holder too. The two square stools fit perfectly underneath the table when not being used. The overall extended size of the table is 29.6″ (w) x 29.1″ (d) x 32.75″ (h). When folded up in its smallest size it measures 29.6″ (w) x 15.7″ (d) x 32.75″ (h). The stools measure 11.4″ (w) x 11.4″ (d) x 20.8″ (h). It comes in the options of round or square edged stools and table, and a teak or natural finish. Another space-saving desk solution for a small room. 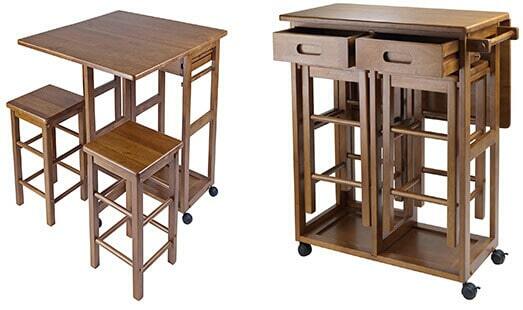 This brown mahogany laptop desk folds away to become just a compact storage area. The wall mounted cabinet includes 4 storage compartments, an angled paper organizer, and a cork-board. It also has a handy drawer or storing things out of sight. The desk is made of MDF, wood veneer, and metal. It comes in a brown mahogany finish. The overall dimensions of the wall mount are 26″ (w) x 6″ (d) x 20″ (h). The writing surface of the desk measures 24.75″ (w) x 13.5″ (d). The Furinno Tray is adaptable and versatile, which makes it perfect for life in a small space. It is primarily a laptop tray, that is designed for use in many different scenarios. The height and angle can be adjusted so that it will fit perfectly on the sofa, bed, or even when traveling. The position is easily changed and can be locked in place too. It comes in a variety of colors to suit your home and doesn’t need any assembly. This isn’t your regular tiny house furniture for sale, but its adaptability makes it a piece of kit that’s becoming more and more popular. 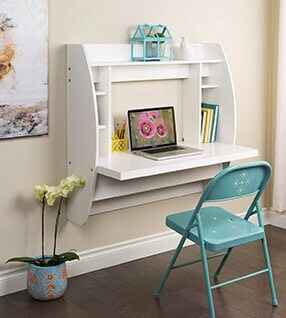 Optimize your small space with a wall mounted floating desk. This elegant desk attaches to the wall at any height using a secure metal hanging rail system. Being suspended like this saves valuable floor space in the home. The desk is big enough to fit a computer, and also has lots of storage space. The side compartments have removable shelves that are perfect for speakers or books. The desk is made of laminated composite woods in a CARB compliant process. It ships with instructions and a 5-year limited warranty. Tiny homes obviously don’t have the same amount of space as some others, so it’s vital to make creative use of any space there is. These are our suggestions for making use of places you might not have thought of. Awkward corner spaces and bare walls can offer storage solutions too. These are some of our favorite tiny house storage ideas. 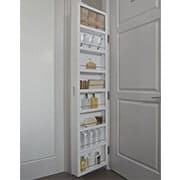 This Cabidor storage cabinet makes use of patented hinge technology to use the “dead space” behind a door as a storage area. The cabinet mounts on any standard door, and won’t mark or scuff any surfaces. It’s a really innovative piece of tiny home furniture. The cabinet has a large storage capacity that includes 6 adjustable shelves, and 2 fixed shelves. All of this is neatly concealed behind a smartly finished cabinet. It is made with high-grade steel rods and has an oil-based enamel finish. 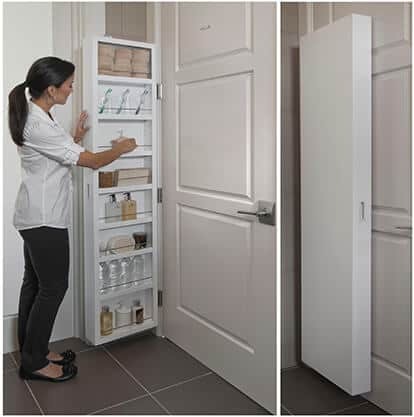 The Cabidor trumps other over-the-door storage solutions with its method of installation. By integrating with the door’s existing hinge hardware, the Cabidor is attached with no drills or nails. 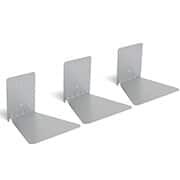 Installation is quick and easy, and the hinge attachment provides sturdy support. It also comes in a variety of different styles. There’s the classic storage cabinet for kitchens (featured in the picture), the wine steward storage, and those with chalkboard or mirror finishes. 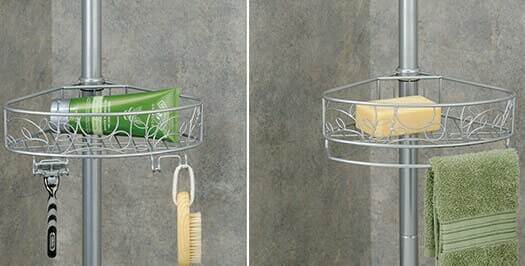 The InterDesign Shower Caddy is a simple and effective way to make the best use of space in the bathroom. The caddy uses patented technology to ensure that it provides a consistent and strong tension no matter how tall your bathroom ceiling is (provided it’s between 5 and 9 feet). This means the caddy always has a sturdy and solid base. 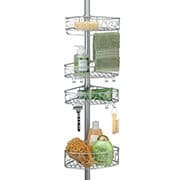 It features configurable shelves for shampoos and soaps, a hanging rack for towels, and also holders for razors. The caddy is made of steel, and finished in a rust resistant coating. 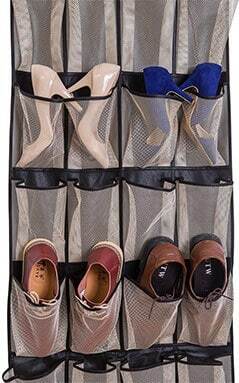 This over the door organizer from Misslo is mainly for storing shoes, but it’s good for toys, clothes, toiletries, and even food. 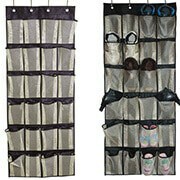 It is hanged behind a door using 4 metal hooks and has 24 mesh pockets. Each pocket measures 5.4″ (w) x 7.8″ (h). The entire organizer measures 56.5″ (l) x 22″ (w). The back fabric is made of two layers of woven fabric. The pockets are made of a breathable and washable mesh. The organizer is lightweight and can be folded up for travel. I really love this concealed bookshelf. 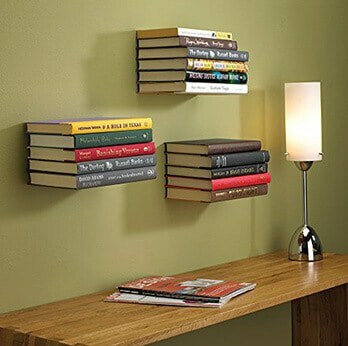 When mounted to the wall it gives the impression of the books floating in mid-air. 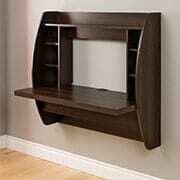 It’s the perfect space saving solution too, as the shelf doesn’t require one large piece of wall space. Simply mount a shelf where you have space. 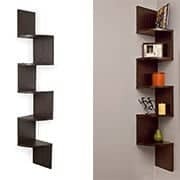 This means the shelves can be scattered around a room or wall. 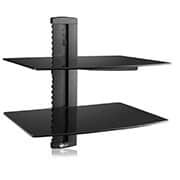 The shelves are made of powder coated steel and come with all the mounting hardware. Each one measures 5.5″ x 7″ x 6.5″ and will support up to 20 pounds in weight or a stack height of up to 8 inches. This design is patented and has also been given numerous design awards. It comes in a choice of sizes and styles. The corner of a room is often a neglected space, but this shelf shows that it can be a perfect place for storage. This decorative shelf manages to look great at the same time too. It comes in a variety of finishes to suit the decor of any home. The multiple shelf areas are perfect for books, photos, and decorative pieces. It would also fit great in the kitchen and be a helpful spice and condiment shelf. The unit measures 7.75″ x 7.75″ x 48.5″ and is easily installed. It attaches to both sides of a wall with two screws or nails. All the necessary hardware is included. It is made from a combination of MDF and laminate. 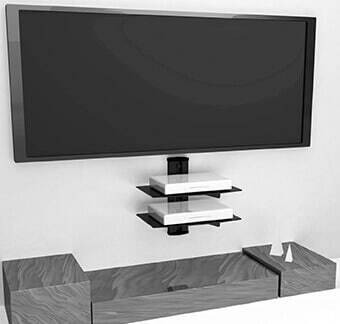 This floating shelf is perfect for the living room. It is built to carry heavy loads of up to 17.6 lbs (8kg), which makes it perfect for any entertainment systems. Things like DVD players, cable boxes, games consoles, Hi-Fi’s and speakers would all fit well on this shelf. It even has a cable management system to hide the mess that their cables can make. It has a slim design that is also strong and supportive. The heights of the shelves are fully adjustable too. It comes with all the hardware needed to mount the shelves. 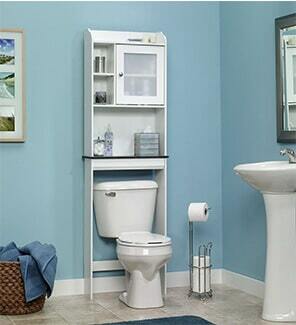 This bathroom cabinet makes great use of space in the bathroom. It fits over the toilet in an area that is usually otherwise unused. The cabinet has lots of storage space. There are two adjustable shelves, a small cupboard with a translucent door, and a cubbyhole. The shelf is nicely finished in a faux slate style, with the rest of the cabinet featuring a soft white finish. It measures 23.25″ (w) x 7.5″ (d) x 68″ (h). Eliminating clutter is key to making life in a small space a success. 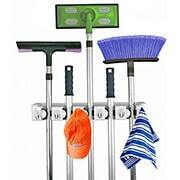 This mop and broom holder has exactly this point in mind and is a great way to keep things organized at home. The organizer automatically adjusts to the thickness of each handle so that it grips each item securely. They are then easily released by simply lifting the item upwards. The grips are perfect for household items like mops and brooms, but also great for sports equipment like golf clubs. The grips are strong and will support up to 7.5 pounds in weight. Having furniture that serves multiple purposes is a real bonus in a small home. A futon should be top of the list for this, as the same space can provide a comfortable place to sit and also a place to sleep. In this section, we recommend three awesome and very different pieces of tiny living furniture for combining sleeping and sitting in the home. We love the hammock best, but everyone loves hammocks right? This futon is a great multipurpose piece of furniture for tiny houses, that can save lots of space in a small room. 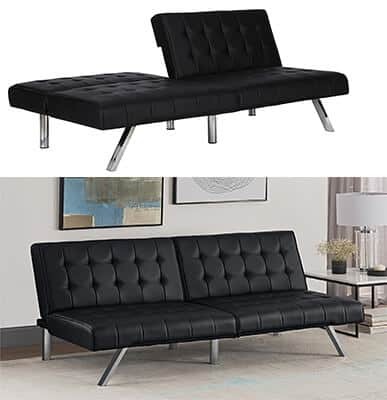 The stylish sofa is easily converted into a twin sized bed at night. This modern convertible futon easily adjusts from sitting position to a slightly reclined lounging position, and then to a fully reclined sleeping position. It has a faux leather upholstery that is easily wiped clean. It also has a split design that means it can provide two different positions at the same time. The cushions are filled with polyester and foam for ultimate comfort. It has sleek chrome metal legs for a contemporary finish. 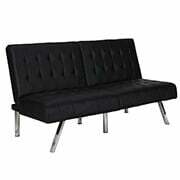 The futon is available in black, navy, grey, and vanilla. A futon is probably the perfect tiny house couch due to its dual use. It measures 32″ (h) x 71″ (w) x 34″ (d) when folded up. This versatile mattress/sofa combination is the perfect tiny house bed. 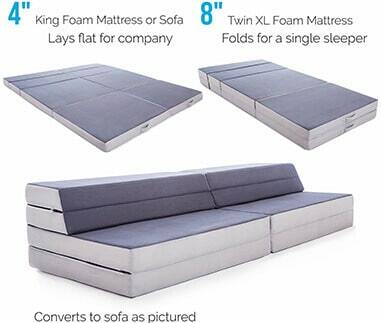 The comfortable sofa doubles up as a 4 inch King-size foam mattress. It can even be folded in half to make an 8 inch twin mattress if need be. It has a stylish cover that is removed with a zip and can even be machine washed. 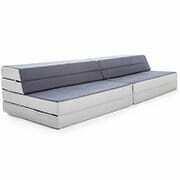 This sofa bed provides more options than the competition. While it is not as elegant as some futons, it is extremely practical and comfortable. It’s perfect for small space living and also if guests are coming over. It’s one of the smarter tiny house furniture ideas we’ve seen. 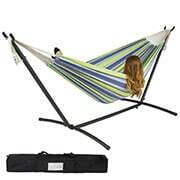 Now the hammock will probably not be a mainstay in the home, but it offers great options if you have guests over. It’s easily assembled with the stand, and even has a compact case for when it’s not in use. It’s also a great option if you just want some time to chill out and read a book. It can be set up indoors or outdoors in minutes. The stand is made from all-weather resin steel and is strong enough to comfortably support up to 450 lbs. in weight (2 adults). The hammock itself is made of 100% cotton for a high degree of comfort. You’ve not experienced pure relaxation until you’ve relaxed in a hammock! That brings us to the end of our space saving furniture ideas for living in a small space. These are (in our opinion) some of the best tiny house furniture ideas around. We’ll be adding to this post when we come across anything we deem worthy enough. We’d love it if you’d let us know about anything cool you’ve found too. Just leave a comment at the bottom of the page, or send us an e-mail. To stay informed of all the latest tiny house news then don’t forget to “Like” us on Facebook (there’s a quick link on the right). We post informative articles about green living and space saving ideas on a daily basis. For more ideas on tiny house furnishings, don’t forget to check out our guide to small kitchens. It’s amazing how much space you can save by decluttering your cupboards with these amazing pieces of design. We recommend 18 awesome utensils and tools that are cheap and great to look at too.